So earlier this week I posted a beautiful picture of some tacos. After being asked several times for the recipe I decided to postpone what I had planned for this Friday’s food Friday and to share the fish taco recipe instead. These tacos were a bit of an experiment and I was so excited with how they turned out. They definitely have a little kick to them, so if you are heat sensitive you might want to reduce the chili powder in fish rub as there is a bit more chili powder in the taco sauce. 2. In a small bowl mix together cumin, chili powder and salt. Set aside. 3. Spray a cookie sheet with olive oil. Place filets on the cookie sheet and rum with spiced. Place in preheated ovens for 10-15minutes. 4. Chop, slice and grate veggies and get them ready for taco assembly. 5. In a small bowl mix together Greek yogurt, like fresh squeezed juice and chipotle pepper. 6. Prepare taco shells according to their directions. For fish tacos I prefer getting nice quality soft tacos so you can warm them up in a pan and get them a little crispy. 7. Stack all the delicious veggies, top with fish and Greek yogurt sauce and ENJOY! I hope you all enjoy this recipe my husband and I definitely did. 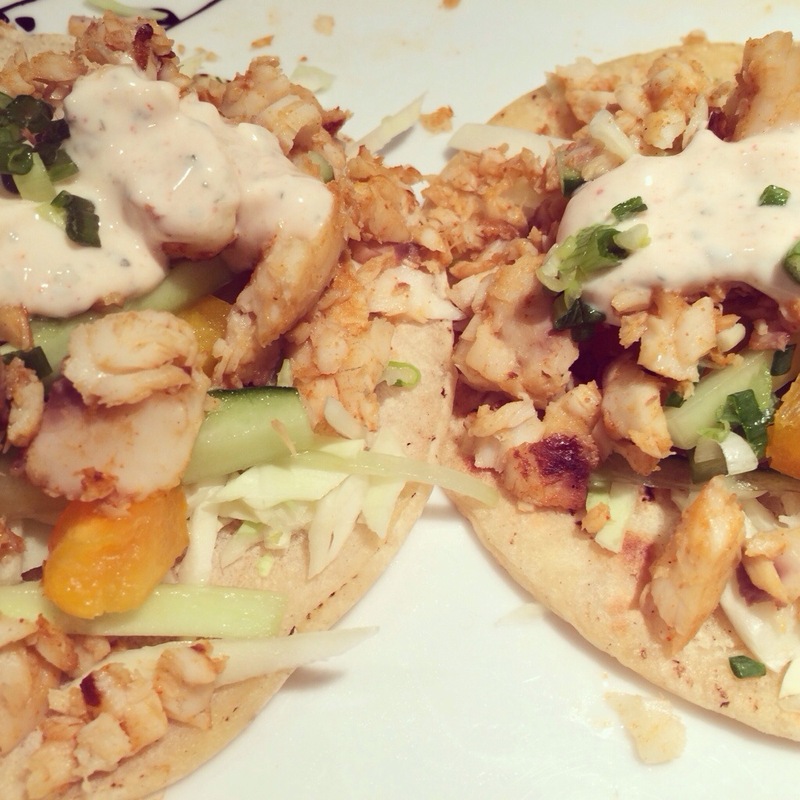 This entry was posted in Food and tagged chili powder, clean eating, fish taco recipe, fish tacos, food, greek yogurt, healthy, low fat, taco, tilapia by healingginger. Bookmark the permalink.